In case there was any fear of The Flash becoming ‘slow’ as it settled into it’s second episode, think again! With origins out of the way the Flash is now on his way to becoming the hero we know he can be; but there’s still a few roadblocks he must overcome. So let’s take a closer look at where he is now; and where he’ll find himself soon enough. Even the “fastest man alive” has his limits, and this episode saw Barry discover the drawbacks to his new situation. Though there’s not just physical limitations he has to learn to work around; but some mental roadblocks as well. In terms of physical, Barry learns that in addition to his increased speed, muscle ton and healing factors, his metabolism has also gotten supercharged. In order to fuel his new powers, he needs to consume a lot more calories to keep himself from passing out. Considering Barry’s salary, eating that much food on a consistent basis might not be plausible; but thankfully Cisco Ramon is able to engineer some super calorie energy bars to keep Barry’s strength up – and not make him look like Goku after a fight. Though it’s not just physical issues that Barry has to overcome; but physiological ones as well. If you thought he could put away all his ‘Daddy Issues’ in the premier, you’d be wrong because Barry has them to spare. He might have Dr Harrison Wells support now; but Detective Joe West still isn’t on board. Thankfully Dr Wells talks with Joe and shows him that Barry is capable of being a hero; but only if he stops doubting himself. With Dr Wells and Joe – Barry’s two father-like figures aside from his real father – now both on Barry’s side, he can finally start to become the hero we know he’ll become. As I just showed, Barry didn’t really have a great grip on things at the start. Even beyond the daddy issues, he also had Dr Snow and Iris giving him reservations about this new life of his. Though in the end, Snow becomes a fully supportive member of Team Flash and Iris admits that she’s fascinated by this ‘red streak’. Sadly, the same can’t be said for Danton Black (aka Multiplex). While Barry found himself surrounded by friends and those who want to protect him, Danton could only fall apart as the person special to him died on his watch. Whereas Barry’s superiors – Dr Wells and Joe – and helping him, Danton’s stole his research, which led to the death of his believed Elizabeth. In the end, Danton didn’t want to be save. Even with the ability to clone himself infinitely, he was still all alone. Another quick noticeable parallel between Barry and Danton is what ‘love’ compelled them to do. 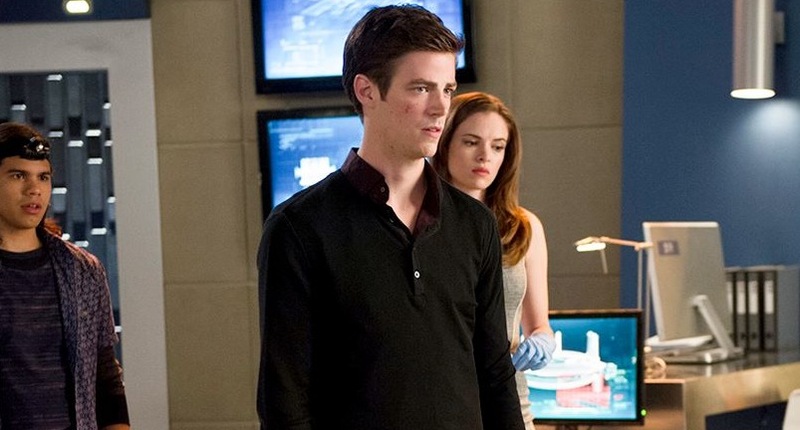 Elizabeth’s death spurred Danton to become a villain while Iris inadvertently spurs Barry to be a hero. We know Barry cares about Iris; but he can’t be with her since she’s with Eddie Thawne. That being said, he does still really like her, and if he can be the one who inspires her – the red streak – then he can at least feel like he has a hand in making her happy. In case we missed Dr Wells standing up last week, we get to see him do it again. Though this time, instead of checking out some newspaper clipping from 2024, he’s killing Simon Stagg. Harsh, sure; but he actually did this to protect the Flash when Stagg revealed that he wanted to hunt him down and study him. There’s sure to be a repercussion for this – or at least there should be since the whole episode was meant to SAVE Stagg – but it still wash done with the best of intentions. Though there’s someone I fear might be using the timeline for personal gain, Eddie Thawne. We knew we didn’t like him last episode; but there’s something about the way he said “right place, right time” that I don’t like. Twice now we saw him be in the right place right time and use it to soak up the spot light. Now I looked up this characters comic counter part and learned a shocking truth. Eddie Thawne is actually based on the character Eobard Thawne in the comics, better known as Professor Zoom/The Reverse Flash. His powers are strikingly similar to Flash and his costume is – you guessed it – yellow with a red thunderbolt. This is strikingly similar to who Barry saw kill his mom. Will things in the series happen like in the comics? I guess we’ll have to wait and see. The Flash has done a great job thus far of balancing action with heart. With Team Flash now coming together, the series is looking even stronger – and hopefully soon, we’ll get another crossover episode with Arrow.